After 12 years of working hard to get Dorevitch to the negotiating table we finally have a new agreement. Since 2007 the MSAV has worked hard alongside delegates and members to secure a new Agreement that provides significant wage increases and preserves conditions of employment. The ballot for your approval of the new Agreement received an overwhelming 97% Yes vote. The new agreement delivers a substantial increase in pay of 22% over 3 years. The first increase is 12%, which will be paid from 20 March once the agreement is approved by the Fair Work Commission. We’ve also negotiated a $5000 lump sum payment, pro-rata for part-timers and people employed for less than a year, which will be paid in your next pay. We expect the lump sum payment to be made very soon. The Union has also been able to protect existing conditions with an additional 5 days for Family and Domestic Violence leave included. The agreement consolidates old agreements that have covered most members since 2004. 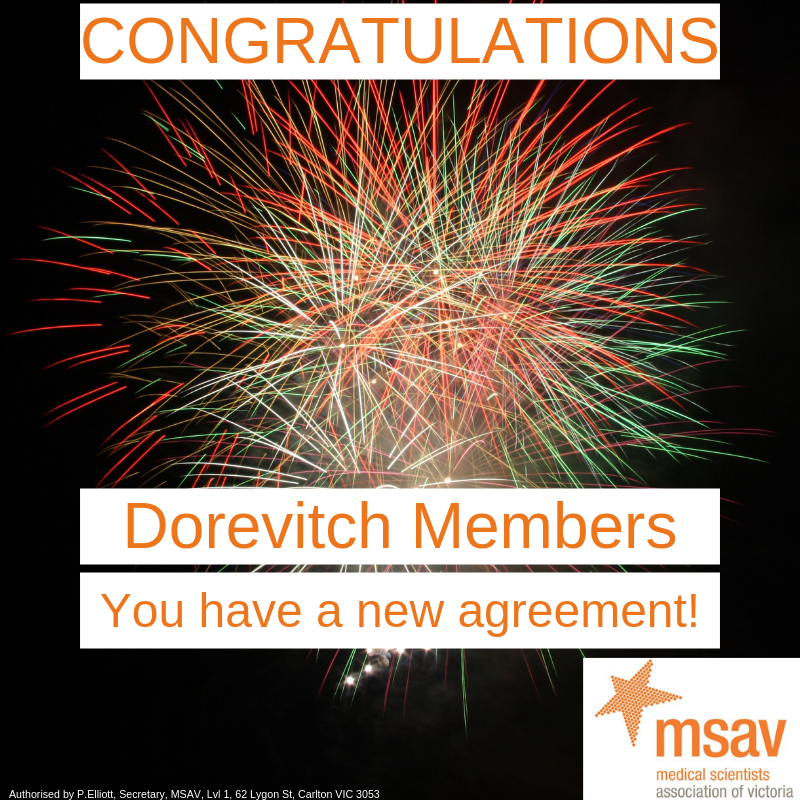 The new agreement ensures conditions are protected with a healthy pay rise, and more importantly, will bring Dorevitch members back into line with other pathology employers. That’s why the Union strongly encouraged members to vote Yes. It shows that we can win when we stick together, despite the efforts of management to oppose your demands for a new agreement. And it’s why over the next few weeks we’re going to be working with delegates to do a major membership drive. We know when we have more members we have a more powerful voice. Congratulations to the members at Dorevtich for their commitment and efforts over many years to get management back to the negotiating table to reach a new agreement. Help share the great news with our social media tile below.